President-elect Fred Lawrence is a natural educator, civil rights and First Amendment expert, scholar and community builder. And, like Louis Brandeis, he’s committed to applying law to social-justice issues. 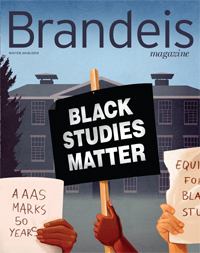 Thanks to the generosity of the Mandel Foundation, Brandeis opens the doors on a $22.5 million facility that signals increased attention to the centrality of the humanities in higher education. Thirty-one of the board of trustees’ 47 voting members are now Brandeis graduates, continuing a trend of increasing alumni involvement in university governance. The Jim Joseph Foundation has given a three-year, $5.2 million grant to the DeLeT teacher education program at Brandeis University and Hebrew Union College-Jewish Institute of Religion in Los Angeles. A Heller School professor discovers that the wealth divide between white and African-American households is not only broad, but broadening. Commencement guest speakers inspire the Class of 2010 and its guests in word and in song. This fall, Brandeis launched a new major that is demonstrating the law of supply and demand; already, 60 sophomores and juniors have entered the program. Awards, honors and new opportunities are marked. It may not be a chest of gold doubloons, but treasure hunters in a music critic’s basement made a Brandeis-related discovery that has Bob Dylan enthusiasts humming with excitement. Fall marks the rededication of Brandeis’ three chapels — Catholic, Jewish and Protestant — and its Muslim prayer center after a $1 million renovation project.